This is another bit of information that was shared with us. We are passing it along to those who may be interested. We are not affliated with them whatsoever. nin is a journal of poetics, and as such we will accept the widest definition of poetry today. Phonetics, ephemera, text with visuals, more. 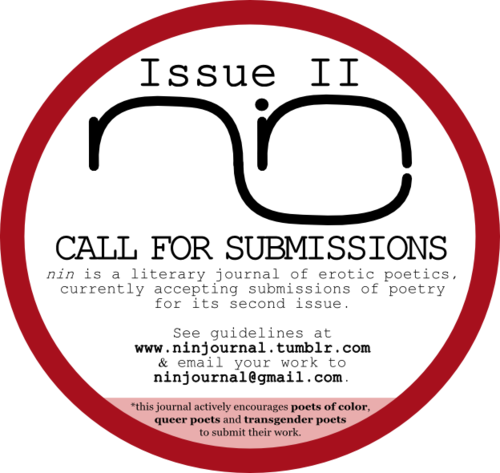 To submit your work to the print journal, please email it to ninjournal@gmail.com. ONLY work submitted via email will be considered for print publication. Please include in your email your name, location & any previous places you have been published and wish to note. PDF, .doc or .odt files only for text. For images, please include a high resolution file of at least 300 dpi. The deadline for submissions to be considered for the second issue is December 31 at midnight.